For the past several decades, leaders in the Sacramento Valley have been developing innovative partnerships and projects to improve salmon, while assuring reliable water supplies for farms, birds, cities and rural communities. These efforts have significantly improved the migratory corridors and habitat for salmon throughout the Valley, leading to mixed success in restoring certain runs of salmon in the region. To further improve salmon runs—there is more work ahead. Now is the time for action! NOAA Fisheries today released its updated recovery plan intended to restore populations of salmon and steelhead in California’s Central Valley over the next 50 to 100 years. The plan was developed in close coordination with the California Ecosystem Restoration Program, which is a multi-agency effort aimed at improving aquatic and terrestrial habitats in the Sacramento-San Joaquin Delta and its tributaries. The federal recovery plan identifies criteria and actions necessary for the protection and recovery of anadromous fish: the endangered Sacramento River winter-run Chinook salmon, threatened Central Valley spring-run Chinook salmon, and threatened Central Valley steelhead. Recovery plans required by the Endangered Species Act are guidance documents, not regulatory requirements, and their implementation depends on the voluntary cooperation of multiple stakeholders at the local, regional, state and national levels. As Maria Rea, NOAA Fisheries Assistant Regional Administrator for California’s Central Valley Office, has provided: “Implementation of this plan will depend on many parties working collaboratively to pool resources, expertise and programs to recover Chinook salmon and steelhead populations that are part of California’s natural heritage. In the Sacramento Valley, the Northern California Water Association (“NCWA”) and water resources managers, as part of ongoing efforts to foster regional sustainability with respect to water resources, have developed significant partnerships with federal and state agencies and conservation partners that have improved migratory corridors and habitat for anadromous fish (salmon and steelhead) within the region. In 2011, fisheries biologist Dave Vogel prepared a scientific report for NCWA and the water resources managers entitled, Insights into the Problems, Progress and Potential Solutions for Sacramento River Basin Native Anadromous Fish Restoration. The water resources managers continue to work with Mr. Vogel to develop and implement a series of actions, summarized below, that will improve fish habitat in the region and help us better understand the actions necessary to help advance the recovery efforts for anadromous fish. Fish Passage Improvements. Over the past several decades there has been tremendous effort to build fish screens and siphons on major diversions in the Sacramento Valley to protect fisheries while assuring water supply reliability for farms, refuges, cities and rural communities. There is an ongoing effort to finalize fish screens on the few remaining high priority diversions in the Sacramento Valley. Instream Flows. The Sacramento Valley has instream flow agreements or requirements on every major part of the Sacramento River hydrologic region, which is summarized in “Instream Flow Requirements in the Sacramento River Hydrologic Region.” These various arrangements will continuously be evaluated over time to assure they provide water supply reliability and benefit fisheries. Spawning Habitat. A gravel recruitment program in key reaches of the river system would help provide spawning habitat for salmon. Salmon Smolt Escapement Plan. Water resources managers, working with various partners, are developing a “Salmon Smolt Escapement Plan” to maximize the escapement of natural and hatchery salmon smolts through the Delta with a coordinated program of water storage releases, fish releases, additional strategic pulse flows, and the timing of diversions. This will help avoid the primary problem of predation, the main source of mortality. High Priority Streams. The California Legislature in 2009 required the State Water Resources Control Board to develop a prioritized schedule to complete instream flow studies for high priority streams by 2018. (Water Code §85087.) To help jumpstart this process, there is an interest in accelerating the implementation of agreements and programs on two high-priority tributaries to the Sacramento River, both of which contain important habitat for spring run salmon: Mill and Antelope Creeks. 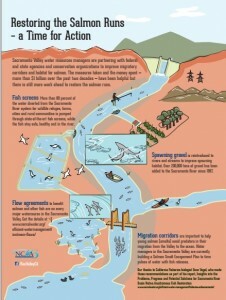 The report is available at the NOAA Fisheries website: Salmon Recovery.